Tone is the use of pitch in language to distinguish lexical or grammatical meaning – that is, to distinguish or to inflect words. All verbal languages use pitch to express emotional and other paralinguistic information and to convey emphasis, contrast, and other such features in what is called intonation, but not all languages use tones to distinguish words or their inflections, analogously to consonants and vowels. Languages that do have this feature are called tonal languages; the distinctive tone patterns of such a language are sometimes called tonemes /ˈtoʊniːm/, by analogy with phoneme. Tonal languages are extremely common in Africa, East Asia, and Central America, but rare elsewhere in Asia and in Europe; as many as seventy percent of world languages may be tonal. In the most widely spoken tonal language, Mandarin Chinese, tones are distinguished by their distinctive shape, known as contour, with each tone having a different internal pattern of rising and falling pitch. Many words, especially monosyllabic ones, are differentiated solely by tone. In a multisyllabic word, each syllable often carries its own tone. Unlike in Bantu systems, tone plays little role in modern Chinese grammar though the tones descend from features in Old Chinese that had morphological significance (such as changing a verb to a noun or vice versa). Contour systems are typical of languages of the Mainland Southeast Asia linguistic area, including Tai–Kadai, Vietic and Sino-Tibetan languages. The Afroasiatic, Khoisan, Niger-Congo and Nilo-Saharan languages spoken in Africa are dominated by register systems. Some languages combine both systems, such as Cantonese, which produces three varieties of contour tone at three different pitch levels, and the Omotic (Afroasiatic) language Bench, which employs five level tones and one or two rising tones across levels. Most languages of Sub-Saharan Africa are members of the Niger-Congo family, which is predominantly tonal; notably excepting Swahili (in the Southeast), most languages spoken in the Senegambia (among them Wolof, Serer and Cangin languages), Koyra Chiini and Fulani. The Afroasiatic languages include both tonal (Chadic, Omotic) and nontonal (Semitic, Berber, Egyptian, and most Cushitic) branches. Numerous tonal languages are widely spoken in China and Mainland Southeast Asia. Sino-Tibetan and Tai-Kadai languages are mostly tonal, including Thai, Lao, all the varieties of Chinese (though some, such as Shanghainese, are only marginally tonal) and Burmese with few exception such as Amdo Tibetan. The Hmong–Mien languages are some of the most tonal languages in the world, with as many as twelve phonemically distinct tones. Austroasiatic (such as Khmer and Mon) and Austronesian (such as Malay) languages are mostly non tonal with the rare exception of Austroasiatic languages like Vietnamese, and Austronesian languages like Cèmuhî and Utsul. Tones in Vietnamese and Utsul were result of heavy Chinese influence on both languages. There were tones in Middle Korean. Other languages represented in the region, such as Mongolian, Uyghur, and Japanese belong to language families that do not contain any tonality as defined here. The only Indo-European languages that have tonality are Punjabi and Lahnda. Although the Austronesian language family has some tonal members such as New Caledonia's Cèmuhî language, no tonal languages have been discovered in Australia. A large number of North, South and Central American languages are tonal, including many of the Athabaskan languages of Alaska and the American Southwest (including Navajo), and the Oto-Manguean languages of Mexico. Among the Mayan languages, which are mostly non-tonal, Yucatec (with the largest number of speakers), Uspantek, and one dialect of Tzotzil have developed tone systems. However, although tone systems have been recorded for many American languages, little theoretical work has been completed for the characterization of their tone systems. In different cases, Central American tone languages have been found to possess tone systems similar to both Asian and African tone languages. Some of the Sino-Tibetan languages. Most of the Sinitic languages (most prominently, Chinese), some Tibetic languages, including the standard languages of Lhasa and Bhutan, and Burmese. In the Austro-Asiatic family, Vietnamese and other members of the Vietic languages family are strongly tonal. Other branches of this family, such as Mon, Khmer, and the Munda languages, are entirely non-tonal. The entire Tai–Kadai languages family, spoken mainly in China, Vietnam, Thailand, and Laos, and including Thai and Lao is tonal. Many Papuan languages of New Guinea like Siane possess register tone systems. Vietnamese has its version: Bấy nay bây bầy bảy bẫy bậy. Another difference between tonal languages is whether the tones apply independently to each syllable or to the word as a whole. In Cantonese, Thai, and to some extent the Kru languages, each syllable may have a tone, whereas in Shanghainese, the Scandinavian languages, and many Bantu languages, the contour of each tone operates at the word level. That is, a trisyllabic word in a three-tone syllable-tone language has many more tonal possibilities (3 × 3 × 3 = 27) than a monosyllabic word (3), but there is no such difference in a word-tone language. For example, Shanghainese has two contrastive tones no matter how many syllables are in a word. Many languages described as having pitch accent are word-tone languages. However, in many African languages, especially in the Niger–Congo family, tone is crucial to the grammar, with relatively little lexical use. In the Kru languages, a combination of these patterns is found: nouns tend to have complex tone systems reminiscent of East Asia but are not much affected by grammatical inflections whereas verbs tend to have simple tone systems of the type more typical of Africa, which are inflected to indicate tense and mood, person, and polarity, so that tone may be the only distinguishing feature between "you went" and "I won't go". In colloquial Yoruba, especially when spoken quickly, vowels may assimilate to each other, and consonants elide so much of the lexical and grammatical information is carried by tone. In languages of West Africa such as Yoruba, people may even communicate with so-called "talking drums", which are modulated to imitate the tones of the language, or by whistling the tones of speech. If generally considering only complex-tone vs. no-tone, it might be concluded that tone is almost always an ancient feature within a language family that is highly conserved among members. However, when considered in addition to 'simple' tone systems that include only two tones, tone, as a whole, appears to be more labile, appearing several times within Indo-European languages, several times in American languages, and several times in Papuan families. That may indicate that rather than a trait unique to some language families, tone is a latent feature of most language families that may more easily arise and disappear as languages change over time. A retired IPA system, sometimes still encountered, traces the shape of the tone (the pitch trace) before the syllable, where a stress mark would go (e.g., ⟨ˆo ˇo ˉo ˊo ˋo ˗o ˴o ˍo ˎo ˏo ˬo⟩). For a more concrete example, take the Hanyu Pinyin syllable [sa] used in Standard Chinese, after applying the diacritics it becomes easier to identify more specific rising and falling tones: [ˆsa] (high peaking tone), [ˍsa] (low level tone), etc. It was used in combination with stress marks to indicate intonation as well, as in English [ˈgood ˌafter`noon]. The most flexible system, based on the previous spacing diacritics, is that of tone letters, which are iconic schematics of the pitch trace of the tone in question. They are most commonly used for complex contour systems, as in Liberia and southern China. Both Swedish and Norwegian have simple word tone systems, often called pitch accent (although they are actually contour tones), appearing only in words of two or more syllables. Each word has a lexical tone, which varies by dialect. Words whose pronunciation differs only in tone are frequently morphologically or etymologically unrelated and may be spelled differently, as in Norwegian cider ('cider'), sider ('sides'). The two word tones are conventionally called toneme 1 and toneme 2 in Norway and acute accent and grave accent in Sweden. In Norway, there are two major dialectal divisions based on tone, roughly eastern and western/northern, where the tones have different values: in the east, T1 = level low, T2 = falling; in the west/north, T1 = falling, T2 = rising-falling. In Limburgish and the Franconian dialects of Germany, tones can also occur in monosyllabic words: dáág ('day'), dáàg ('days'). Limburgish is typically a two-tone system, distinguishing between level high and falling, but the tones can be realized in other ways depending on syntax, and some vowels diphthongize or monophthongize under certain tones. Depending on the dialect, Latvian has a two-, three- or four-tone system. In practical alphabetic orthographies, a number of approaches are used. Diacritics are common, as in pinyin, but they tend to be omitted. Thai uses a combination of redundant consonants and diacritics. Tone letters may also be used, for example in Hmong RPA and several minority languages in China. Tone may simply be ignored, as is possible even for highly tonal languages: for example, the Chinese navy has successfully used toneless pinyin in government telegraph communications for decades. Likewise, Chinese reporters abroad may file their stories in toneless pinyin. Dungan, a variety of Mandarin Chinese spoken in Central Asia, has, since 1927, been written in orthographies that do not indicate tone. Ndjuka, in which tone is less important, ignores tone except for a negative marker. However, the reverse is also true: in the Congo, there have been complaints from readers that newspapers written in orthographies without tone marking are insufficiently legible. André-Georges Haudricourt established that Vietnamese tone originated in earlier consonantal contrasts and suggested similar mechanisms for Chinese. It is now widely held that Old Chinese did not have phonemically contrastive tone. The historical origin of tone is called tonogenesis, a term coined by James Matisoff. Tone is frequently an areal rather than a genealogical feature: a language may acquire tones through bilingualism if influential neighbouring languages are tonal or if speakers of a tonal language shift to the language in question and bring their tones with them. In other cases, tone may arise spontaneously and surprisingly quickly: the dialect of Cherokee in Oklahoma has tone, but the dialect in North Carolina does not although they were separated only in 1838. Very often, tone arises as an effect of the loss or merger of consonants. (Such trace effects of disappeared tones or other sounds have been nicknamed Cheshirisation, after the lingering smile of the disappearing Cheshire Cat in Alice in Wonderland.) In a nontonal language, voiced consonants commonly cause following vowels to be pronounced at a lower pitch than other consonants. That is usually a minor phonetic detail of voicing. However, if consonant voicing is subsequently lost, that incidental pitch difference may be left over to carry the distinction that the voicing had carried and thus becomes meaningful (phonemic). That happened in Punjabi: the Punjabi murmured (voiced aspirate) consonants have disappeared and left tone in their wake. If the murmured consonant was at the beginning of a word, it left behind a low tone; at the end, it left behind a high tone. If there was no such consonant, the pitch was unaffected; however, the unaffected words are limited in pitch and did not interfere with the low and high tones. That produced a tone of its own, mid tone. The historical connection is so regular that Punjabi is still written as if it had murmured consonants, and tone is not marked. The written consonants tell the reader which tone to use. 1 2 Yip (2002), pp. 1–3, 12–14. ↑ R.L. Trask, A Dictionary of Phonetics and Phonology, Routledge 2004. Entry for "toneme". ↑ Odden, David (1995). "Tone: African languages". Handbook of Phonological Theory. Oxford: Basil Blackwell. ↑ Yip (2002), pp. 178–184. 1 2 3 Maddieson, Ian (2013). "Tone". In Dryer, Matthew S.; Haspelmath, Martin. The World Atlas of Language Structures Online. Leipzig: Max Planck Institute for Evolutionary Anthropology. ↑ Yip (2002), pp. 174–178. ↑ Wedeking, Karl (1985). "Why Bench' (Ethiopia) has five level tones today". Studia Linguistica Diachronica et Sinchronica. Berlin: Mouton de Gruyter. pp. 881–902. ↑ Yip (2002), p. 131. ↑ Yip (2002), pp. 172–173. ↑ Ho-Min Sohn (29 March 2001). The Korean Language. Cambridge University Press. pp. 48–. ISBN 978-0-521-36943-5. ↑ Iksop Lee; S. Robert Ramsey (2000). The Korean Language. SUNY Press. pp. 315–. ISBN 978-0-7914-4832-8. ↑ Ki-Moon Lee; S. Robert Ramsey (3 March 2011). A History of the Korean Language. Cambridge University Press. pp. 168–. ISBN 978-1-139-49448-9. ↑ Lust, Barbara; Wali, Kashi; Gair, James; et al., eds. (1999). Lexical Anaphors and Pronouns in Selected South Asian Languages. Walter de Gruyter. p. 637. ISBN 978-3-11-014388-1. ↑ Ager, Simon (ed.). "Punjabi (ਪੰਜਾਬੀ/پنجابی)". Omniglot. Retrieved January 30, 2015. ↑ Karamat, Nayyara. "Phonemic Inventory of Punjabi" (PDF). Center for Research in Urdu Language Processing. Retrieved January 30, 2015. ↑ Sen, Geeti (1997). Crossing Boundaries. Orient Blackswan. p. 132. ISBN 978-81-250-1341-9. Possibly, Punjabi is the only major South Asian language that has this kind of tonal character. There does seem to have been some speculation among scholars about the possible origin of Punjabi's tone-language character but without any final and convincing answer. ↑ Yip (2002), pp. 212–214. 1 2 Montgomery-Anderson, Brad (May 30, 2008). A Reference Grammar of Oklahoma Cherokee (PDF) (Ph.D.). University of Kansas. p. 49. ↑ Tones change over time, but may retain their original spelling. The Thai spelling of the final word in the tongue-twister, ⟨ไหม⟩, indicates a rising tone, but the word is now commonly pronounced with a high tone. Therefore a new spelling, มั้ย, is occasionally seen in informal writing. ↑ Singh, Chander Shekhar (2004). Punjabi Prosody: The Old Tradition and The New Paradigm. Sri Lanka: Polgasowita: Sikuru Prakasakayo. pp. 70–82. ↑ Hombert, Jean-Marie; Ohala, John J.; Ewan, William G. (1979). "Phonetic Explanations for the Development of Tones". Language. 55 (1): 37–58. doi:10.2307/412518. ↑ Specifically, words that had the Middle Chinese ping (level) tone are now distributed over tones 1 and 2 in Mandarin Chinese, while the Middle Chinese shang (rising) and qu (exiting) tones have become Mandarin Chinese tones 3 and 4, respectively. Words with the former ru (entering) tone, meanwhile, have been distributed over all four tones. ↑ The seminal references are Haudricourt (1954) and Haudricourt (1961). Bao, Zhiming (1999). 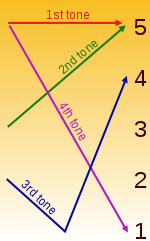 The Structure of Tone. New York: Oxford University Press. ISBN 0-19-511880-4. Chen, Matthew Y. (2000). Tone sandhi: Patterns across Chinese dialects. Cambridge, England: Cambridge University Press. ISBN 0-521-65272-3. Haudricourt, André-Georges (1954). "De l'origine des tons en vietnamien". Journal Asiatique. 242: 69–82. Haudricourt, André-Georges (1961). "Bipartition et tripartition des systèmes de tons dans quelques langues d'Extrême-Orient". Bulletin de la Société de Linguistique de Paris. 56 (1): 163–180. Hyman, Larry M., (2007a). There is no pitch-accent prototype. Paper presented at the 2007 LSA Meeting. Anaheim, CA. Hyman, Larry M. (2009). "How (not) to do phonological typology: The case of pitch accent" (PDF). Language Sciences. 31 (2): 213–238. doi:10.1016/j.langsci.2008.12.007. Yip, Moira (2002). Tone. Cambridge Textbooks in Linguistics. Cambridge: Cambridge University Press. ISBN 0-521-77314-8. ISBN 0-521-77445-4 (pbk).